The Children’s Ministries program, intended for children age Pre-K through Grade 5, creates many opportunities to build the foundation of our children’s relationship with God. 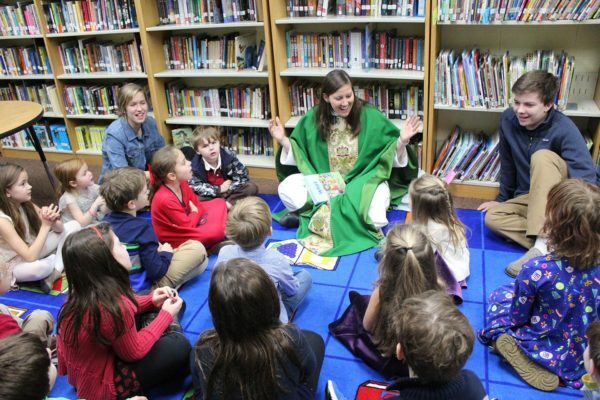 Children’s Chapel: This program strives to deepen the children’s understanding of our Episcopal worship service. At the 10:00 a.m. service, during the Sequence Hymn, children from 3 years old to 2nd grade, are invited to gather in the back of the church with the Children’s Chapel adult leaders. Children experience the age appropriate Liturgy of the Word and then return to their families during the peace. Your child is welcome to either join in or remain in church. We warmly welcome volunteers of all ages to join us in teaching the homily to our children. Volunteers rotate and are typically assigned a few homily dates per year. Training, curriculum and materials are provided. Sign up today. Sunday School: This is where the foundation of our children’s relationship with God deepens. Sunday School occurs between the 8:00 a.m. and 10:00 a.m. services, during our Christian Education hour at 9:00 a.m. Register your child(ren) today for the 2018-2019 year. We welcome anyone who feels a calling to teach our youngest members about embracing and celebrating the joy of God’s presence in their lives. Parish volunteers teach assigned classes for the school year. Training, curriculum and materials are provided. Volunteer today. Nursery Co-Op: Care is provided during church services and Sunday School to children ages 3 and under. Volunteers are paired with our professional child care provider, Ms. Reita Turro. Commitment is for approximately 2.5 hours on Sunday morning, on a recurring basis. Volunteers of all ages, not just families of young children, are welcomed warmly and eagerly into our Nursery Co-Op. Sign up today.